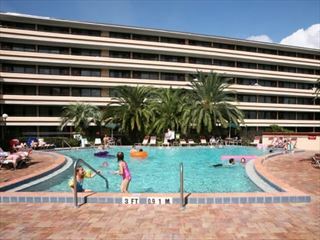 Situated in the heart of Orlando on International Drive, the Rosen Inn International offers comfortable accommodation and great value for money. The hotel’s excellent location makes it convenient to walk to a variety of activities, restaurants, shops and Volcano Bay. Additionally there is a free scheduled shuttle service to Universal Orlando, SeaWorld, Volcano Bay and Aquatica. The hotel has refurbished the comfortable and well-equipped bedrooms. There are two swimming pools and children’s wading pool, a children’s playground and a range of eating and drinking options. Top Tip: Great value - at this hotel, children aged nine and under eat free when accompanied by a paying adult (one child per adult). 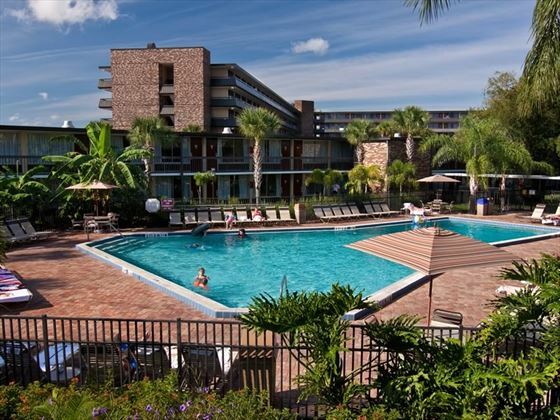 Set in the middle of International Drive, Rosen Inn International has countless restaurants, shops and attractions right on their doorstep and is only a short drive from SeaWorld Orlando, Aquatica, Universal Orlando Resort, Volcano Bay and Walt Disney World Resort. The hotel has 728 rooms on 6 floors, rooms have either two double beds or one king size bed, sleeping up to 4 people or 5 with a rollaway bed (Roll away beds are available for a supplement of approx $15 (plus tax) per day payable locally.). Prices correct as at 6pm on 22 Apr 2019. Please call for final price. Prices are per person based on 2 adults & 2 children sharing. Other durations available - call for quote. Prices include flight and accommodation as stated below. Great value transfers or car hire packages with Dollar rent-a-car are available, please ask your Florida travel expert for more information. For the purposes of the prices above, children are assumed aged 11 and under. Teen prices also available. 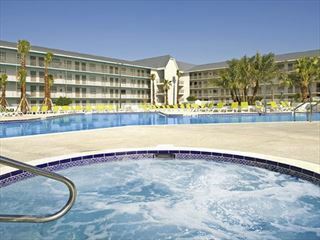 The Ramada Plaza Resort & Suites is conveniently located near to Universal Orlando Resort so you'll be sure to have an exciting adventure whilst staying at this hotel.